Solar thermal systems available today offer efficiency and reliability. They can be applied in different conditions to meet space- and water-heating requirements in the residential, commercial and industrial building sectors. The potential for this technology and the associated environmental benefits are significant. This fully updated edition of 2004's bestselling guide offers clear guidance on planning and installing a solar thermal system, crucial to the successful uptake of this technology. All major topics for successful project implementation are included. Beginning with resource assessment and an outline of core components, it details solar thermal system design, installation, operation and maintenance for single households, large systems, swimming pool heaters, solar air and solar cooling applications. Details on how to market solar thermal technologies, a review of relevant simulation tools and data on selected regional, national and international renewable energy programmes are also provided. 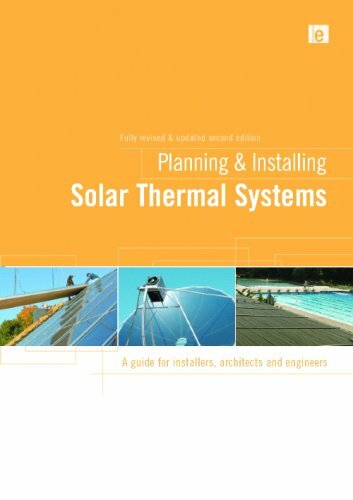 In short, the book offers comprehensive guidance for professionals who wish to install solar thermal technology and is a highly valued resource for architects and engineers alike who are working on new projects, electricians, roofers and other installers, craftsmen undertaking vocational training and anyone with a specialized and practical interest in this field. Planning and Installing Photovoltaic Systems: A, (DGS)..